Drawdown happens when losses in a trading account outweigh profits over a certain period. If you trade in any kind of volatile market, some drawdown is inevitable. It is one of the risks associated with putting your money into financial markets. Drawdown becomes a serious problem though when the losses are large in proportion to the funds held in the account. 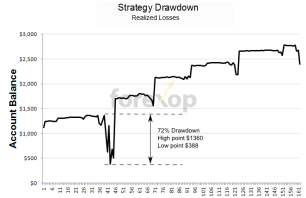 Strategy drawdown: Strategy drawdown happens when a trading system encounters a period of losses in succession. The realization of losses causes the balance of the account to fall beneath a previous high. 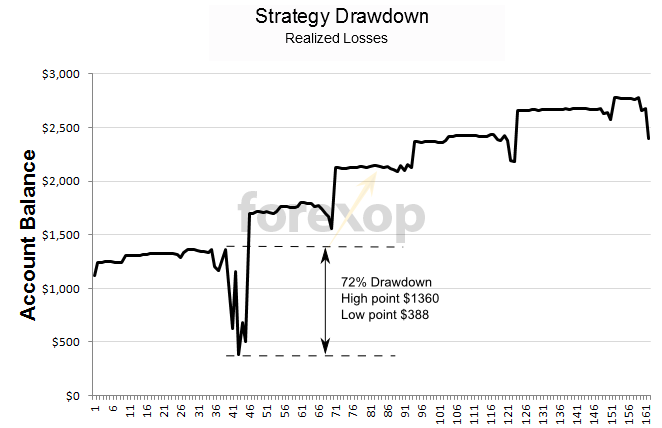 When strategy drawdown is deep and prolonged, it can indicate a failure in the trading system. It can also be due to a change in market conditions such as trending or volatility, which can destabilize a weak strategy. Example: On day 1, a trader’s account balance is $1250. On day two after closing three open positions, his balance is $1200. The strategy drawdown is $50 or -4%. 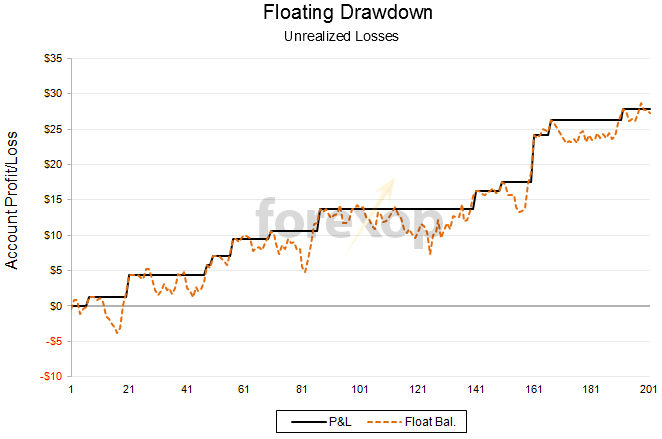 Float drawdown: Float drawdown also known as floating losses happen when the running balance of the open trading positions in an account becomes negative. The distinction between float drawdown and strategy drawdown is that float drawdown is unrealized P&L. This type of drawdown changes continually with market fluctuations. Example: A trader’s account balance is $1250. He has one open EUR/USD position with a net loss of $100. The floating drawdown is $100, or -8%. The account equity (balance – float) is $1150. The first thing to realize is that drawdown is a normal, if undesirable part of trading. There is no such thing as a strategy or a trader that does not experience drawdown. Statistically, in the very first tick after opening a trade there is a 50% probability that a price will fall below the open level (ignoring spread). For the lifespan of most trades, the odds of experiencing drawdown at some point are 90% or higher. In other words, at best expect only one in ten of your trades not to experience drawdown at some point. With longer timeframes, the chances of the price not falling below the open level are even more remote. As time increases, the odds of the price moving below (above if selling) the open increase asymptotically to 100%. Volatility is always present in the forex market, and trying to avoid it is a bit like going to sea and expecting not to see any waves. For many traders, dealing with drawdown is a major psychological battle. This becomes most severe when the drawdown is big enough that it threatens to bust the account. There are two ways to look at drawdown. The optimists view and the pessimists view. Opportunity cost: When you have open positions in drawdown, it ties up capital in your account. That represents an opportunity cost. 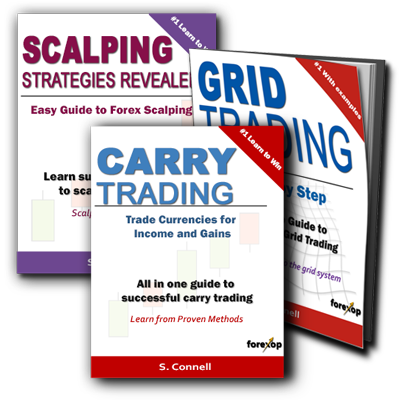 eBook value set for the classic trading strategies: Grid trading, scalping and carry trading. All ebooks contain worked examples with clear explanations. Learn to avoid the pitfalls that most new traders fall into. Trading costs: If the currency pairs you are trading have a high negative swap rate (the interest you pay on each rollover), these fees accumulate each day and can become costly. The psychological drain: Some traders may see drawdown as being a failure, rather than a normal consequence of market movements. This can result in a loss of confidence or even in the trader giving up. Margin call risk: Margin calls happens when floating losses are so high that they cause leverage limits on the account to be exceeded. If this happens, the trader can have his positions closed out automatically at the worst possible point. Recovery time: The deeper the drawdown, proportionally the more difficult the recovery phase becomes. A fifty percent drawdown requires a doubling of the account equity. That’s a 100% return just to recover. A 95% drawdown requires a staggering 1900% percent return just to break even. This is why many accounts and managed funds that fall into deep drawdown never recover. It’s normal! Volatility is something you have to accept as a trader. Drawdown events are simply the ebb and flow of asset prices that exist in any financial market. After all, these swings are what provide our opportunities to profit. Mean reversion: Markets revert to mean levels over time. An extreme market move is often followed by an equally extreme counter move. Therefore, a drawdown is simply the market preparing for a swing in the opposite direction. Buy/sell opportunity: An extreme market level can represent an entry opportunity to buy at a lower price (sell at a higher price). Strategies such as Martingale and grid trading use drawdown to accumulate the position. Carry interest: if you are trading to accumulate interest, carry trading that is, drawdown will be more acceptable because each day your position is clocking up more interest in your account. Learning: It creates a learning opportunity. There is nothing better than real experience with real money to teach a good lesson. One strategy that some traders use to offset losses is to trade pairs that move in opposite directions to each other. That is, currencies that have negative or low correlation to each other. If you trade pairs with high correlation, this amplifies both losses and gains because the currencies move in tandem. On the other hand, when you trade pairs that move in different directions, the loss in one can be a gain in the other. The downside of this is that while it lowers risk it also limits profits. If you find your trading positions are regularly in deep and persistent drawdowns, it can be a sign that you need to work on your market timing. Check all timeframes: Before entering, always check charts at both lower and higher timeframes than the one you are trading. It is also worth checking down to the minute level (M1) to optimize your entry point. Avoid entering at peaks (troughs): A very common mistake, and a reason for many drawdowns, is jumping into a rally that is nearing exhaustion. Look for the approach of major support and resistance lines in related markets including stocks and commodities. For example, if you are trading Canadian Dollars, look for key support and resistance in the oil markets that may prompt a reversal in the currency. Wave Patterns: Be mindful of the wave nature of forex and try to enter in the troughs (buying) or peaks (selling). Chart tools such as Elliott Wave and Fibonacci are helpful in determining pivot levels – along both the price axis and time axis. Grids: Using a grid strategy will help you to divide your entry up and average out price extremes. Experienced traders rarely enter the market with a single block trade. Instead, they use staggered entries. For example, split your entry across three to four trades. Not only does this average out your entry price, it also averages the spread. Avoid news releases: If you are a technical trader, it is wise to avoid trading just before or after important news releases. Trading around announcements from central banks or around the issue of key employment data such as nonfarm payrolls is especially risky. The best way to limit the impact of drawdown is to have a proper money management plan where the account is never over exposed. Losses do happen so it is better to accept and prepare for them. When an account is over leveraged, drawdown becomes a very serious problem because a few poorly planned trades can be enough to empty the account very quickly. Markets tend to underestimate the chance of surprise events, even though history shows such events do happen from time to time. These high-impact but hard to predict events are called “black swan events” from a theory first put forward by Nassim Nicholas Taleb. This is a recent example of a black swan event. There are many others. In October 2016 a flash crash in GBP/USD sent the pair down by 700 pips or 6% in a few minutes. Many blamed this on automated trading. It may not be possible to predict the next black swan event, but it is sensible to look at worst-case scenarios and be prepared. Many financial analysts warned that the Swiss currency peg was a disaster waiting to happen. Just one week before, Catherine Bosley at Bloomberg wrote a piece covering the alarming increase of foreign currency reserves that the Swiss National Bank was accumulating trying to defend the peg in the face of the weakening Euro. The warning signs were there like a flashing neon sign for those who looked. It can be a tough decision to exit a position in drawdown. In deciding, factors to check are whether the fundamentals on the currency have changed since you entered the position. If the movement is technically driven, then riding it out can make sense. Once you have decided to exit the position and take the loss, it becomes a case of damage limitation. What is good for entering the market is also good for exiting. Rather than exiting the position in one leg, a staggered exit can even-out the exit price and avoid hitting extremes. This is more straightforward if you also entered the market through multiple trades (grid) rather than as single block. Some brokers and trading platforms will not allow partial closure of a position so it is best to check first. Averaging out also lessens the risk of exiting at a capitulation point. See below. Have you ever noticed that the market seems to reverse just as everyone reaches the point of highest negativity (or positivity in an uptrend)? This phenomenon, known as capitulation, happens in all financial markets. Traders experiencing drawdown will reach a point where their losses are so great that a recovery seems hopeless. In this state, they become irrationally bearish. Panic follows as they become desperate to claw back as much of their account as possible. A wave of stop orders often causes a sudden and accelerated move in the price level that overshoots fair value by some distance. At this point, the smart money enters (exits) to take advantage of the pricing anomaly. Traders often quit at capitulations only to see the market reverse and exceed the previous level. The reversal would have yielded them a profit if they had held their nerve. You can usually spot the capitulation as it comes at the end of a strong trend, where selling (buying) sharply accelerates creating a deep overshoot. Aim to be in the “smart money” group. Thanks..Moving down stop losses is also a bad mistake you can live to regret if not careful. Useful tips! Drawdown is a matter of personal tolerance i think – where some people are quite ok to have 700 pip (or big in prct level) drawdown while for others it is a nightmare. Can a Negative Mindset Hurt Your Profits? Steve Connell spent over 17 years working in the finance sector and has experience in a range of financial markets from foreign exchange, commodities to options and futures.